Laurel Lance built a good life for herself in Arrow season 7. The former Black Siren reinvented herself as the District Attorney of Star City. She also found herself becoming more and more like the Laurel Lance of this world. Laurel even built a friendship with Felicity and allied herself with Team Arrow. Unfortunately for Laurel, her past has already come back to haunt her. By exposing Emiko Queen to Oliver, Laurel set herself up for reprisal. In response to that move, Emiko framed Laurel for the murder of a witness in SCPD custody. She also released a picture of Laurel with the late Ricardo Diaz. That’s the more damning piece of evidence, because it’s true. 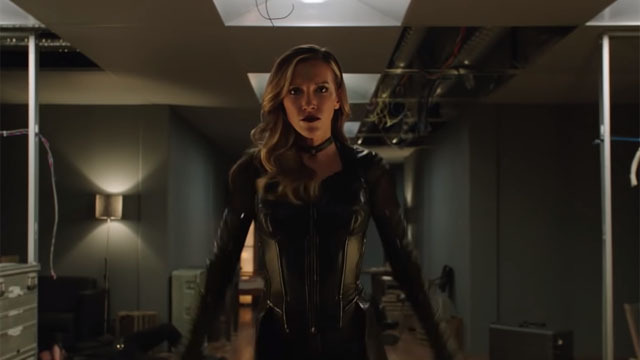 Now, in the advance promo for Arrow episode 7.18, Laurel is on the run and Black Siren lives again! To take down Laurel, Dinah Lance/Black Canary is teaming up with Sara Lance/White Canary from DC’s Legends of Tomorrow. The episode, “Lost Canary,” is paying tribute to the Birds of Prey comic that starred Black Canary. In this case, Sara and Felicity are substituting for Huntress and Oracle, respectively. Felicity even has a key moment in the promo, when Laurel claims that their friendship was a lie. Regardless of the truth, Felicity may be Laurel’s best hope of making it out of this crisis with her life. Arrow episode 7.18 “Lost Canary” will air on Monday, April 15, on The CW. What do you think about the new promo? Let us know in the comment section below!